1 – Pod the peas and cover with the litre of water, place this on the heat and bring to the boil. 2 – Simmer for 5 minutes, and then throw away the pods, retaining the pea stock. 3 – In a heavy-based pan, fry the butter and onions and season well with salt and pepper. Once the onions are soft, add the pea stock, cream and milk and bring to the boil. You must do this before adding the peas to retain the vibrant pea colour. 4 – Add the peas to the boiling liquid and cook for 4 minutes or until the peas are cooked. Remove from the heat and blend while it is still hot. 5 – Pass the soup through a fine strainer that has the mint sprig in it. This is a tiny amount of mint but will do the job of infusing the soup. Reserve in the fridge and on ice if possible, ready to serve at a chilled temperature. 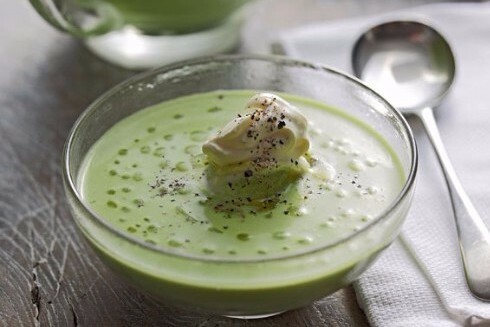 6 – Ideally, serve the soup with crème fraîche and pea shoots and serve from a chilled jug.